I mentioned this blue nail varnish is my Best of 2012 Nails post and I realised when I put it on this week that I STILL haven't reviewed it for you guys. I had already put some glitter over the top so I thought I would just combine it all for a NOTD post! So let's start with Denim. It's a 'denim' blue colour, with very sutble glitter running through it to give the effect of jeans. I fell in love with it because it's glue and glittery - but not too glittery so it's perfect for everyday wear. My lovely Grandma bought me Rose Quartz Glitter for my birthday in November - ahead of the glitter top coat trend my Grandma! - and I love it. It's a pain in the bottom to remove, but its a mix of small and large sequins and glitter to create a mixed affect, and as the name suggests it's a very pale pink so again, subtle. I'm not a huge nail art person - mainly cause I'm so lazy I can't be bothered - but I saw a post with just the glitter top coat at the base of the nail so I thought I would try that out, with a mix of full nail as well on my ring finger. Unfortuantely my little finger decided it wanted a full coat as well opps! Overall, I really like this cute look. 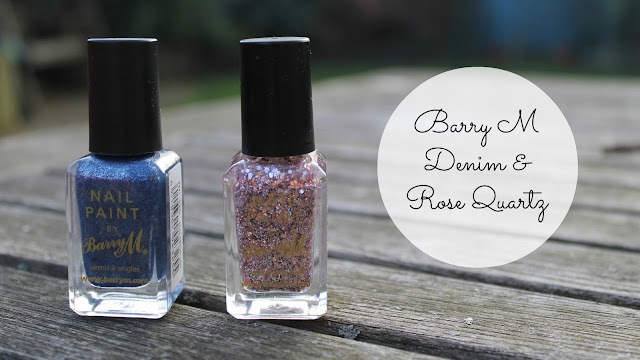 It's great for everyday and as with all Barry M nail paints they last for ages, dry really quickly and the pigmentation on Denim is fab. This is two coats, but you can get away with just the one! What do you think of my lazy girl nail art? What Barry M paints should I pick up?